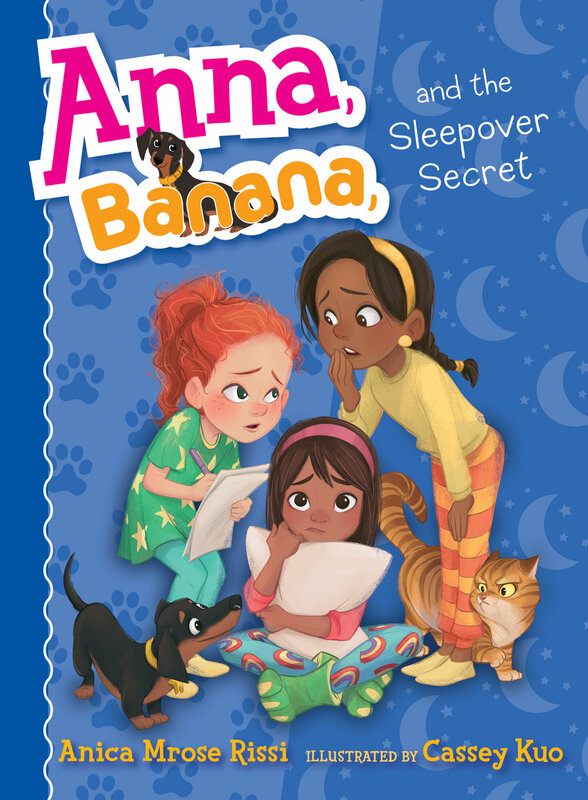 Anna and her friends love sleepovers...and sharing secrets! So when Anna and Sadie get invited to spend the night at Isabel's house for the first time, they know it's going to be amazing. Make your own pizzas, supersparkly nail polish, and a secret surprise from Sadie are sure to make this the most fun sleepover yet. The only way it would be better is if Anna’s dog, Banana, could come! But sometimes secrets can go from so fun to no fun. When Isabel's sisters join the game of Truth or Dare, Anna's dare goes horribly wrong. Suddenly the girls are stuck with a huge secret they wish they didn't have to keep. Order the book now by using these links: Indiebound | B&N | BAM | iBooks | Amazon | Target | Indigo | Book Depository | S&S | or ask for it at your local bookstore or library. "Is it time for the surprise yet?" I said. Isabel looked back and forth between us. "What surprise?" she asked. Sadie grinned. Excitement zipped through me like two squirrels playing chase around a tree. Now I was glad Sadie hadn't told me the secret on the car ride, so I could find out about it at the same time Isabel did. Sadie opened her backpack, reached deep inside, and took something out. We couldn't see what it was yet because she kept it hidden in her palms. Finally, she lifted one hand with a flourish to reveal the secret thing she held. "Ta-da!" she exclaimed.